In 1967, Alfred F. Young transformed his Northwestern doctoral dissertation into a dense saga of New York’s Revolutionary power players and their roiling class wars, entitled The Democratic Republicans of New York: The Origins, 1763-1797 (Chapel Hill: Published for the Institute of Early American History and Culture at Williamsburg, Va., by the University of North Carolina Press). Young’s work, in many ways, spoke both to the colonial past that he studied and to the America of President Lyndon Johnson, a nation beset by party strife over civil rights, the Vietnam War, and a range of social issues. And, tucked away near the volume’s end, Young shared a few bright-lines of inquiry for any student of political history—no matter that his focus here is firmly fixed on New York State. “I have been interested in politics as it is organized by the leaders,” Young writes, “how it appears up front to the voters, how it all turns out in the elections, and what the elected do with political power” (596). Supplying a new origins story of American party politics, Young explains that the American Revolution yielded conservative Whigs (later Federalists) and popular Whigs (anti-Federalists); the latter faction in New York coalesced around the leadership of George Clinton. New York anti-Federalists, as Young argues, developed a Republican (and, subsequently, a Democratic-Republican) interest that sought to advance state goals more than any platform issue espoused by the Jeffersonians. Dissatisfied with prior understandings of the Jeffersonians, Young twists away to look at “Republican landlords, merchant and mechanic Republicans, and frontier Federalists” (viii). He wants to know how local manor lords voted (and, in turn, “ensured” their tenants’ votes); which issues fractured the New York political community (ratification, Hamiltonian finance); when Federalist strategy kept them “at bay”; and finally, how they came to be known, by 1797, as an “organized movement” with “democratic, libertarian, constitutionalist, humanitarian articles of faith” who acted in “sympathy for ‘the middling classes’”(582). Clearly, this is an ambitious project. One of Young’s greatest contributions is to plant the story in deeper context, rooting it in a political landscape pitted with landlord-tenant battles, “confused” political campaigns, and the “tortured” machinery of the state assembly. To write a history of the broader national movement, Young expertly harvests New York sources that show the depth and breadth of political philosophy and party spirit. Nearly a half-century on, Young’s narrative history remains a foundational citation for scholars working in early American political history (and, as I will gratefully testify, for documentary editors laboring to identify key agents in an era of federal formation and dissent). In roughly 636 pages studded with detail, Young reminds us that writing local history means tackling an epic chapter of American political life. When he composed Democratic Republicans, Young aimed to bridge a pair of landmark studies, E. Wilder Spaulding’s New York in the Critical Period, 1781-1789, and Dixon Ryan Fox’s The Decline of the Aristocracy in the Politics of New York, 1801-1840. Young begins by picking up Carl Becker’s query of “Who shall rule at home?” To carry the question into the federal period and to broaden the focus beyond landlord aristocrats to include mechanics and artisans, Young splits the sprawling book into a fivefold exploration of the central theme. Immediately, Young centers a great deal of his story around the life and career of Clinton, indoctrinating and magnetizing the reader to the shadowy world of state politics with a research avalanche of colorful characters, electioneering details, and census data. Yet he deploys that context with forensic care. The Delancey-Livingston rivalry, for example, informs but does not fully overshadow his narrative. His source work is rich, multi-layered, and impressive, with an insistence on New York State as the focal point of analysis. A well-curated appendix, with tables of polling data and state expenses, is buttressed by a bibliographical essay that is a fine model for how to study a political movement at what Young calls the “grass-roots” level. His analytical lens is tight, sometimes frustratingly so. It is curious to read Young’s work now, and to note his lack of interest in the transatlantic factors that shaped his cohorts’ political interests; they are New Yorkers and Americans only and in all respects. Finally, a word about style and tone: As an unabashedly hard-working narrative historian, Young achieves something important here, making the legislative sound downright lyrical. He parses rhetoric cautiously, using incisive language to describe the actions of both political camps. And to other early Americanists, the scholar has some hard words of advice about his choice of genre. At the outset, Young warns us that if we push past another estate description for a better view of the political scene, then we’ll miss his point. “If the detail is tedious to some who are impatient for analysis,” Young writes, “I am hopeful that it will find favor with others who believe as I do that presenting the texture of history is as important as drawing conclusions” (x). Young’s legacy, as seen in Democratic Republicans, is to remind us that state politics deserve serious investigation when reinterpreting the story of national government and party formation. For, Young’s New York remained, long after independence and statehood, a dynamic empire of competing interests. 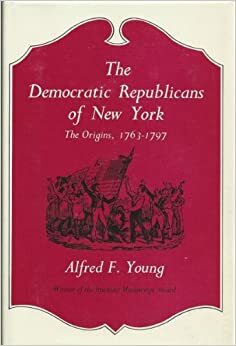 Sara Georgini has an article about Alfred F. Young’s classic The Democratic Republicans of New York: The Origins, 1763-1797. Georgini explains that “state politics deserve serious investigation when reinterpreting the story of national government and party formation.” Young’ s book fundamentally altered the narrative surrounding political formation in colonial America.